Disadvantages: A bit spendy but worth it! Easily installed this on my R3 August of 2017 and it works and looks great more than a year later. I was sold on the quality and styling it made TST a household name here. 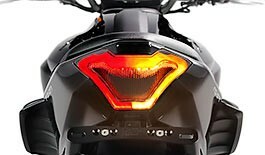 Since I enjoyed the light so much and get so many positive complements when riding, I recently purchased the integrated tail light for the Ninja 400 also. Advantages: Designed integrates with the R3's styling, programable flash rate is a safety plus, installs effortlessly. Disadvantages: no disadvantages after 1 year and 1/2 use. Excellent customer service. They contacted me to confirm shipping due to the possibility of a Canada Post strike. Purchased the Tail light, fender eliminator, adjustable licence plate bracket, and more. Perfect fit on all components. 100 % satisfaction with the company and the components. Orleans, Ontario Canada. this tail light gives the R3 that look that it was design to have. as soon as my package arrived, i installed it along with the fender eliminator and adjustable tag mount. i had watched the videos about 3 times and i knew exactly what to do. installation of everything took about 45 minutes and this is the first time i've ever worked on a bike. i ordered the relay but there was no need for me to install that. i also ordered the license plate light and i didn't need to install that either. tst's customer service support is one of the best, and shipping was super fast. i live in charleston sc and my package arrived in 2 days. now i can't wait for the halo-1 flush mount signals. I was a little concerned with brightness, but wow this light looks great. It is very bright and visible. All the different flash patterns are a plus as well. Installation is really easy, especially if you've taken the plastics off before. Buenas tardes quiero saber si el stope.sirve para la mt07 y si puedo conservar las direcionales originales. AMAZING tail light. I just installed yesterday on my FZ-07 and looks so badass. I thought the smoked lens and with the Raven color of that bike, it is just perfect. Love the programmable options as well. I set it for a sweep for the blinkers and the strobe stoplight. I am no mechanic, but Bart's videos on Youtube are really good. Two thumbs up. Disadvantages: 0, perfect product to me! What you see is what you get. A direct replacement multifunction light to clean up the back of your bike. WARNING If you click the "Buy together and save" link for the flasher relay your selections for "smoked" and such will be reset. Also I picked up some micro LED bulbs and popped two holes in the fender eliminator kit for a tag light and it works perfectly. Disadvantages: Super bright buddy behind me was blinded when stopping at night. Advantages: Montaz je uplne lahka aj vdaka vasmu videu.